Respond with Kindness – We can make quite a difference in the lives of the homeless when we respond to them, rather than ignore or dismiss them. A kind wo rd and a smile go a long way. Develop Lists of Shelters – Carry a card that lists local shelters so you can hand them out to the homeless. You can find shelters in your Yellow Pages. 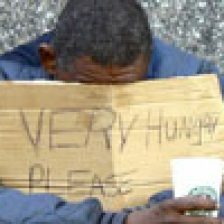 Donate – One of the most direct ways to aid the homeless is to give money. Donations to nonprofit organizations that serve the homeless go a long way. Give Clothing – Next time you do your spring or fall cleaning, keep an eye out for those clothes that you no longer wear. If these items are in good shape, gather them together and donate them to organizations that provide housing for the homeless. You can also check our list of organizations that accept donated goods. Give A Bag Of Groceries – Load up a bag full of nonperishable groceries, and donate it to a food drive in your area. If your community doesn’t have a food drive, organize one. Contact your local soup kitchens, shelters, and homeless societies and ask what kind of food donations they would like. Volunteer Your Professional Talents – No matter what you do for a living, you can help the homeless with your on-the-job talents and skills. Those with clerical skills can train those with little skills. 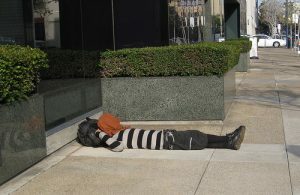 Doctors, psychiatrists, counselors, and dentists can treat the homeless in clinics. Lawyers can help with legal concerns. The homeless’ needs are bountiful — your time and talent won’t be wasted. Volunteer Your Hobbies – Every one of us has something we can give the homeless. Wherever our interests may lie — cooking, repairing, gardening, photography — we can use them for the homeless. Through our hobbies, we can teach them useful skills, introduce them to new avocations and perhaps point them in a new direction. Volunteer At Battered Women’s Shelters – Most battered women are involved in relationships with abusive husbands or other family members. Lacking resources and afraid of being found by their abusers, many may have no recourse other than a shelter or life on the streets once they leave home. Volunteers handle shelter hotlines, pick up abused women and their children when they call, keep house, and offer counseling. Call your local shelter for battered women to see how you can help. Publish Shelter Information – Despite all of our efforts to spread the word about shelters, it is surprising how many people are unaware of their own local shelters. Contact your local newspapers, church or synagogue bulletins, or civic groups newsletters about the possibility of running a weekly or monthly listing of area services available to the homeless. This could include each organization’s particular needs for volunteers, food, and other donations.